Oil is India's biggest import item and an increase in oil prices push inflation up and widens the trade deficit, putting pressure on the rupee. So far in 2018, retail prices of petrol have climbed 9.2 per cent and diesel by 13.7 per cent in Delhi. 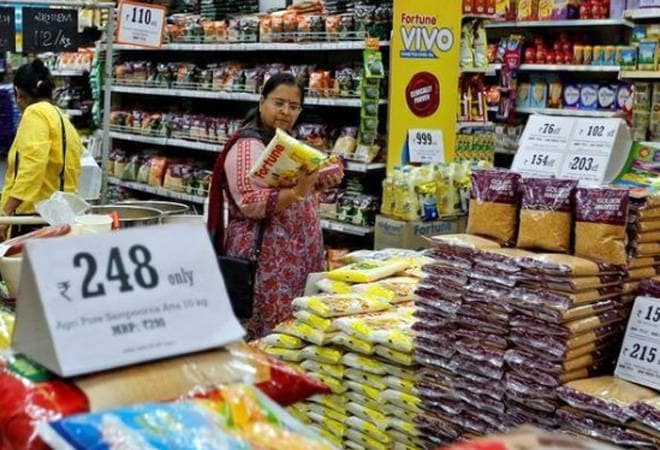 The country's retail inflation accelerated to a four month high of 4.87 per cent in May as fuel prices shot up during the month and food items such as fruits and vegetables turned costlier compared with the same month last year, official data released on Tuesday showed. Inflation in April was estimated at 4.58 per cent. Fruit prices grew at a faster pace of 12.33 per cent in May while vegetables were costlier by 8.04 per cent. In the case of fuels, the inflation for the month worked out to 5.8 per cent. Oil is India's biggest import item and an increase in oil prices push inflation up and widens the trade deficit, putting pressure on the rupee. So far in 2018, retail prices of petrol have climbed 9.2 per cent and diesel by 13.7 per cent in Delhi. The rupee has depreciated 5.3 per cent since January 1, pushing up the prices of imported items such as electronic goods and machinery apart from oil. The acceleration in inflation has raised fears that the RBI may go in for an interest rate hike again when it reviews the monetary policy again in August. The Reserve Bank of India last week raised its benchmark interest rate for the first time since 2014, by 0.25 per cent to 6.25 per cent. Central banks in many emerging markets are raising rates to stem capital outflows, battle inflation and support domestic currencies following a resurgence in the dollar on higher U.S. interest rates. The Federal Reserve on Wednesday is widely expected to raise U.S. rates for the second time this year. Many economists believe that last week's rate increase by the RBI is the beginning of a gradual tightening cycle as inflationary pressures build up in the economy, though the RBI has kept its policy stance at "neutral" last week. However, the flip side of the coin is that higher interest rates make consumer and corporate loans more expensive which chokes demand and dampens investment. This in turn leads to a slowdown in the economic growth rate. "Inflationary pressures are building up in the economy," said Tushar Arora, senior economist at HDFC Bank. "The possibility of one more rate hike cannot be ruled out this year." May was the seventh straight month in which inflation was higher than the RBI's mediumterm target of 4 percent. The RBI has revised up its inflation forecast to 4.7 percent for the second half of the current fiscal year ending in March 2019, from the 4.4 percent seen earlier. PPF or Mutual Funds: Where should you invest your money?